This has also become known as the "scream-as-you-go" method because until you figure out how it's done, it can definitely send you running for a few servings of chocolate! Several good pages have already been written by other knitters about this technique and this is just another, hopefully somewhat useful, addition. The picture above shows two panels joined by the seam-as-you-go method. It makes a very smooth and hardly noticeable seam from the right as well as the wrong side. The hardest part about this method of joining panels is getting started in the right spot, at least that was the worst for me. 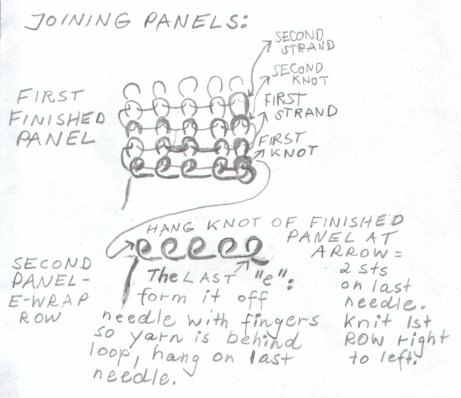 There are two ways of joining panels - you can use either the knots or the longer strands on the outermost edge. The longer strands (stitches) are always between two knots. The knots are not really knots but stitches which have turned sideways and slipped down a ways. 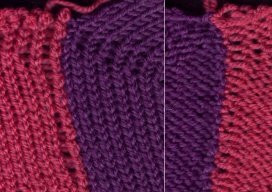 To join panels, you always knit the first one separately, then join it to the next one as it is being knitted. When the second one is finished, it is joined to the third as it is being knitted, etc. It's probably a good idea to practice on a small sample first, that way if you make a mistake, you won't have too much to unravel. Where do the Knots come from? 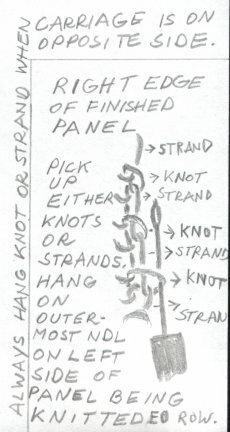 Above is a not real fancy drawing of how the knots come about. When you get to the end of a row and you pull up the slack in the yarn to knit back to the other side, the strand of yarn is pulled through the stitch (red) to form a new stitch (green stitch on top of red one). 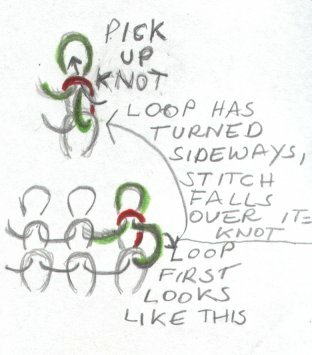 After a short while the green loop on the side connecting the rows turns sideways and to the left and the red stitch slips down over it. You'll barely be able to see the loop anymore but the red stitch now looks like a knot. The green stitch will always be between two knots and will look like a longer strand along the side edge. You have the choice of picking up either one or the other. Picking up the knot, in my opinion, makes a closer seam, but it's really a matter of preference. 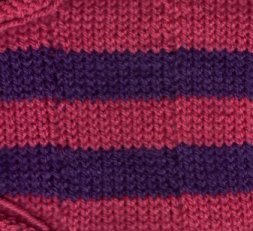 When you begin with an e-wrap, you normally end up with a very small loop at one bottom corner of your knitted piece that doesn't seem to be secured too well. If you pull on it the wrong way, it can come out and make a fairly large hole in that spot. If you make that last e-wrap as shown in the drawing above, with the yarn behind the "e" instead of in front of it, then the stitch in that corner will be secured and can't be pulled out. Try this on a small sample - just a few stitches and rows (count how many rows), then bind it off. My favorite way of binding off is to knit a row of longer stitches by either using a larger keyplate or by pulling the yarn through the needles manually one by one. Push all the needles to holding position, holding the fabric against the bed as you do. With a latch hook tool, grab the first stitch (the one furthest away from the ball of yarn) and pull it off the needle. It will close the latch as it comes forward and slip right off. Let it slide behind the latch, then grab the next stitch with the latch hook tool and pull it off the needle. Pull the stitch on the hook through the one behind the latch. Repeat until the last stitch has been pulled through, then pull the yarn through the last loop. Sorry, got sidetracked, now back to the seam-as-you-go: E-wrap needles for a second sample, from left to right, ending with the last "e" as above. The carriage is on the right side. Hold the first panel so the purl side is facing you. Find the lower right corner of it and look for the knot as shown in the top of the drawing above. Poke the transfer tool through this knot, pull it sideways to make it a little larger, then hang it on the e-wrapped needle on the left side (bottom of drawing above). Bring that needle out to forward working position with both knot and stitch behind the open latch. Knit the row from right to left. Knit back to the other side. Then find the next knot, holding the first panel so it's straight, not twisted, and still facing you with the purl side. Here is another drawing of the side edge of a finished panel. Put the transfer tool through a knot as shown and deposit it on the last needle of the piece that is being knitted whenever the carriage is on the opposite side. Or if you prefer, insert the tool into the longer strand that is between the knots and hang it on that same needle. Just one strand - not two. Make sure you keep track of your rows and knit the same number for all panels - otherwise you won't come out even at the top! If you're trying to match up stripes using this method, you may want to hang the knots instead of the strands or loops because they seem to match up a little better. The seam in the right half of the picture was made by hanging the knots, the seam in the left side of the picture by hanging the loops or strands. Once I took a closer look at the stitches and saw how they were formed, it made it a lot easier for me to find the knots and strands. Maybe the same will work for you!